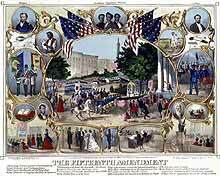 In Baltimore on May 19, 1870, 20,000 participants celebrate the ratification of the 15th Amendment. Americans had long been suspicious of the federal government playing too large a role in the affairs of state. But the Radicals felt that extraordinary times called for direct intervention in state affairs and laws designed to protect the emancipated blacks. At the heart of their beliefs was the notion that blacks must be given a chance to compete in a free-labor economy. In 1866, this activist Congress also introduced a bill to extend the life of the Freedmen's Bureau and began work on a Civil Rights Bill. 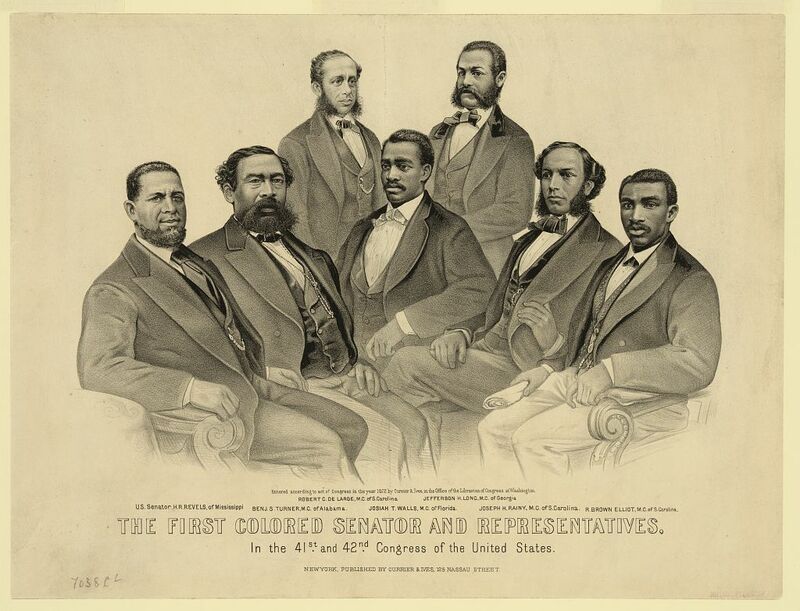 Hiram Revels of Mississippi was elected Senator and six other African Americans were elected as Congressmen from other southern states during the Reconstruction era. President Johnson stood in opposition. 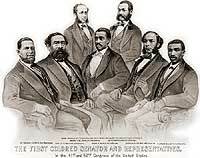 He vetoed the Freedmen's Bureau Bill, claiming that it would bloat the size of government. He vetoed the Civil Rights Bill rejecting that blacks have the "same rights of property and person" as whites. Moderate Republicans were appalled at Johnson's racism. They joined with the Radicals to overturn Johnson's Civil Rights Act veto. This marked the first time in history that a major piece of legislation was overturned. The Radicals hoped that the Civil Rights Act would lead to an active federal judiciary with courts enforcing rights. 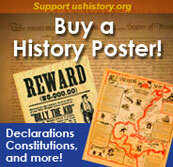 Congress then turned its attention to amending the Constitution. In 1867 they approved the far-reaching Fourteenth Amendment, which prohibited "states from abridging equality before the law." The second part of the Amendment provided for a reduction of a state's representatives if suffrage was denied. Republicans, in essence, offered the South a choice — accept black enfranchisement or lose congressional representation. A third clause barred ex-Confederates from holding state or national office. Which plan for Reconstruction do you think was more effective in reintegrating the South into the Union? Emboldened by the work of the Fourteenth Amendment and by local political victories in the 1866 elections, the Republicans went on to introduce the Reconstruction Act of 1867. This removed the right to vote and seek office by "leading rebels." Now the Southern Unionists — Southerners who supported the Union during the War — became the new Southern leadership. The Reconstruction Act also divided the South into five military districts under commanders empowered to employ the army to protect black property and citizens. 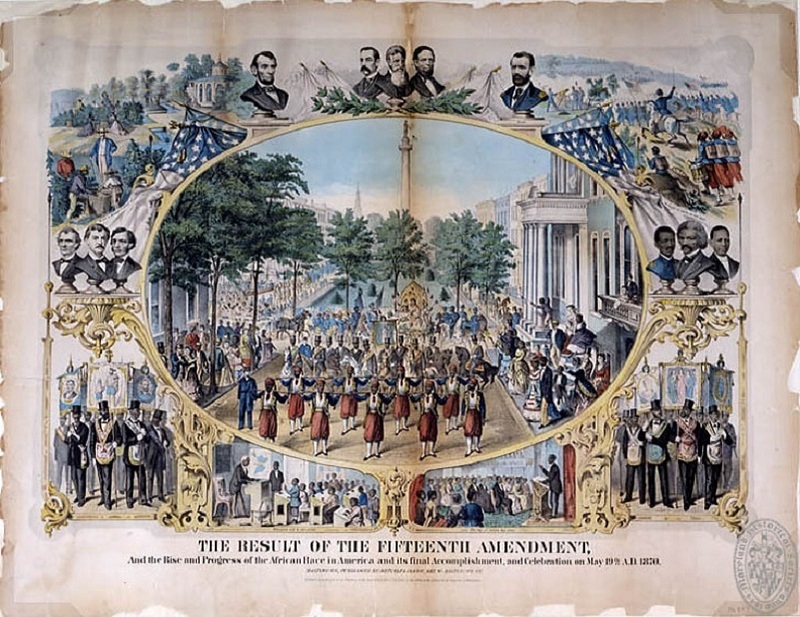 The first two years of Congressional Reconstruction saw Southern states rewrite their Constitutions and the ratification of the Fourteenth Amendment. Congress seemed fully in control. One thing stood in the way — it was President Johnson himself. Radical leaders employed an extraordinary Constitutional remedy to clear the impediment — Presidential impeachment. Thaddeus Stevens was buried in an African American cemetery under a tombstone reading, "I repose in this quiet and secluded spot, not from any natural preference for solitude, but finding other cemeteries limited as to race by charter rules, I have chosen this that I might illustrate in my death the principles which I advocated through a long life: EQUALITY OF MAN BEFORE HIS CREATOR.